Submitted by Kergillian on Sat, 11/03/2012 - 5:08pm. BareBones FantasyTM and Keranak KingdomsTM are trademarkes of DwD Studios. The game, setting, and likenesses are copyright 2012 DwD Studios. The material presented in this publication is fan-generated content and all trademarks and copyrighted material are used with permission under the Creative Commons Attribution-Noncommercial-Share Alike 3.0 Unported License. These races are intended to expand the PC options presented in the Bare Bones Fantasy rulebook. You must have your GM's permission before selecting one of the listed rces. A few of these races are very similar to race presented in other copyrighted RPGs. These are not intended to be exact recreations, but rather something that has the look and feel of those races, but in broad brushstrokes. These races have not been play-tested. Savage -10 to social interactions with civilized races. Mimic- The changeling may appear to be a member of any humanoid race and of any gender. This may be used to copy specific individuals. In some cases the GM may allow a WIL reaction to see though the deception. +10 to Deception and Diplomat checks. May make Scholar (Diplomat) checks unskilled. Linguistics- Learn new language by spending DP equal to the number of languages already known. Breath Weapon Once per encounter may expel a cone of fire dealing 3d damage to all creatures in a 4 space line in front of the Dragonborn. A DEX reaction is allowed to to avoid. Wood elves are not as magically talented as their High elf brethren, but they have a fierce reputation as warriors and scouts. Standing about nine feet tall, this is small as giants go, but a manageable size for a PC. Huge Standing well over 9 feet tall Giants must pay double for their equipment. Ferocious +10 with favored weapon. Must practice with a weapon for one full day to make it a favored weapon. Only one weapon may be favored at a time. +10 to Survival checks undergound. Poor vision, -10 to ranged combat. Hardy- Immune to ingested poisons may eat anything organic, no matter how rotten or spoiled. Subtract 5 from minimum STR requirements for Armor and Weapons. The Lilithii are a race of winged humanoids. Most Lilithii are born wingless and are identical to humans in all other respects (Use Human for wingless Lilithii, substituting the Lilithii language for anglish.) Winged males have feathery wings and are very rare, winged females have bat-like wings and are tho most common of the winged Lilithii. Flight- Move 12 spaces in open terrain. Wings make armor awkward. Lilithii may not ly while wearing armor heavier than studded leather. Talented: Select a second skill to begin at level 1. Aquatic- +10 to Swim checks, my hold breath for 20 minutes. Living Construct Need not eat, drink, sleep or breath. Immune to fatigue. Cannot heal naturally, but may be repaired. Magical healing works normally. Armored Body (DR 3) may not wear armor, but may upgrade armor. Slam attack does 1d+1 damage. May only speak Mantid, but most understand tradespeak. 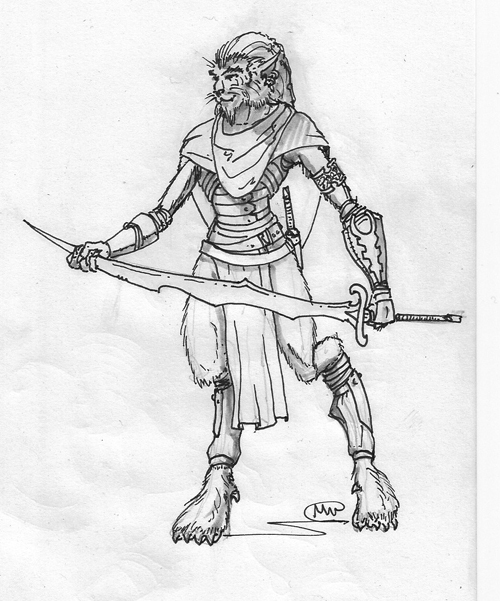 Descended from pure blooded lycanthropes, shifters have inherited part of their ancestor's bestial nature. Shift add 10 to STR and DEX, and +1 to Move while shifting. Shifting lasts WIL/10 rounds (round up) Afterward the Shifter in Fatigued until he has had a short rest. A Shifter may not shift while fatigued. Close kin to Pixies, Sprite are slightly larger. Invisibility +20 to Stealth checks. Once spotted the Sprite becomes visible to all and may not become invisible again while being watched. A Sprite is automatically spotted by anyone she attacks. Naturally magic: Start with Spellcaster Level 1. This need not be your primary or secondary skill. Submitted by Kergillian on Sat, 11/03/2012 - 1:46pm. Submitted by Kergillian on Sat, 11/03/2012 - 8:41pm. Updated PDF. 20 Races to add to your game. Submitted by w00t on Sat, 11/03/2012 - 11:27pm. I'm really liking version 1.1! It's great how you put a blurb that explains why this race could be playable. :-) Also the "learning languages" game option is neat. If you intend these races to be playable in Keranak Kingdom, suggest a placement on the map and possible reason they would exists here. For instance, "Tigerfolk" hail from the jungles of Ravenreach and although naturally afraid of large bodies of water still seek passage across the water to travel the lands of the lesser-folk. Map link for those that don't have the game. Nice use of simple math, "Leap (STR/10) spaces". Note: Still working on the 8x11 background, I have not forgotten. Submitted by Ascent on Sat, 11/03/2012 - 11:36pm. Thank you for using "Dragon kin" instead of you-know-who. I was going to design a Tinker Gnome in response to the Artificer, but you've done a fine job with the Gnome. Though my approach was going to be to make the Artificer Skill mandatory for gnomes for either the chosen Primary or Secondary skill. Larry, great suggestion on specifying the region. Submitted by Kergillian on Sun, 11/04/2012 - 10:00am. Thanks! I got the 8x11, I'll use it on the next draft. I'll correct the BareBones and 1D as well. I intentionally left locations vague, but I'll happily add "Suggested Homelands"
I'll have the finished Artificer up later today. Rather than reinvent the wheel, I just added notes on how the existing system for creating magic items can be used for contraptions. Eventually I'd like to add art and get these published. Submitted by Kergillian on Sun, 11/04/2012 - 1:45pm. Updated. Also included a printer friendly version. Now I'm looking for art. I would like to try to get this published, one way or another. My preference would be to have it as an official DwD product, if possible. Submitted by w00t on Sun, 11/04/2012 - 6:41pm. I'm also working on getting a submissions queue setup for I think your article is a bit big for that publication and might be better served as a supplement with a cover and interior art like you mentioned in your post. Submitted by Kergillian on Sun, 11/04/2012 - 7:06pm. Submitted by Telmar on Sun, 11/04/2012 - 10:39pm. Just posted on wrong thread! May not be Clerics. They are a created race and unloved by the Gods. Submitted by DwD Studios on Sun, 11/04/2012 - 8:34pm. Submitted by w00t on Sun, 11/04/2012 - 9:29pm. I'm curious, who did that artwork? Submitted by ShadowStalker on Sun, 11/04/2012 - 9:31pm. Very cool - my little girl is now happy she has her 'cat' race. Does "Music Soothes the Savage Beast" make them susceptible to Charm? Submitted by Telmar on Sun, 11/04/2012 - 9:47pm. thanks Larry! Me of course, just a quick sketch. Submitted by Telmar on Sun, 11/04/2012 - 9:49pm. I was thinking a few things regarding "Music Soothes the Savage Beast". They are a musically inclined race and music has a large part in their Daily lives. Bards get a positive reaction from them. An excellent way to defuse a bad situation with them is to show you can play an instrument or sing. Every character should touch on music in some way. Since they have no gods it substitutes for spirituality for them. Submitted by w00t on Sun, 11/04/2012 - 11:05pm. I like a race that respects music. Would such a race us sound as a weapon? Perhaps specially crafted horns deafen foes or cause them to be stunned. Their magic users imbue sonic effects (rather than lighting/fire) on their magic weapons. Submitted by Telmar on Mon, 11/05/2012 - 12:26am. Ping me Larry. I write professionally too. i might be willing to put together a module or three. My Wife's an Artist and writer as well. Think Drums and percussion. Cat mouths are not well suited to brass Instruments and brass gets hot in the desert sun. Submitted by w00t on Mon, 11/05/2012 - 1:35am. Brass does indeed get hot, I was thinking the horns from a creature like a ram. Perhaps your race can simply use their hands/paws cupped to the mouth to make interesting sounds. Wooden pipes and "turkey" calls work too. Submitted by Irda Ranger on Mon, 11/12/2012 - 12:36am. This is a great document. If you don't mind, I would love it if the plain text was shared to a Google Document so that others can copy / edit / reuse it for their own campaigns. The PDF is nice, but I cannot easily update (e.g.) Bugbears to fit my campaign. Submitted by w00t on Mon, 11/12/2012 - 2:10am. You should be able to copy the text from the PDF into Notepad or Word and modify to your liking. Kergillian and DwD are working on providing a 20 race supplement based off his work. Each page will feature stats, racial write-up, customs/religions, how you might play them and where they might fit into the Keranak Setting. It will include a cover, images for each race and follow the CC licensing. A text/RTF version is an interesting idea. Submitted by Mulsiphix on Mon, 11/12/2012 - 12:10pm. I would be happy to convert the PDF to a Word/RTF document. Would that be okay to do so and post here? Submitted by Nightstorm on Mon, 11/12/2012 - 1:36pm. Submitted by w00t on Mon, 11/12/2012 - 2:03pm. Seek Kergillian's permission, you can use the contact link. Submitted by Kergillian on Mon, 11/12/2012 - 7:56pm. Submitted by Kergillian on Mon, 11/12/2012 - 8:02pm. You can copy and paste what you need quite easily. If it's really a problem, I'll post a .doc or .rtf version later. Attached is an early draft in .odt (Open Office) format. But a lot has changed since this draft. Submitted by Kergillian on Fri, 11/16/2012 - 4:30pm. Final draft is off to DwD. They are working on getting art and before too long, a shiny new BareBones supplement will be born! I've greatly expanded the race descriptions, and further tweaked the stats. Notes on how to incorporate into the Kingdoms of Keranak settings, and the Artificer skill write up are included. 20 races, one per page, each illustrated. Submitted by jasales on Fri, 11/16/2012 - 9:02am. Submitted by The Fifth Wanderer on Fri, 11/16/2012 - 10:17am. Submitted by Mulsiphix on Fri, 11/16/2012 - 2:41pm. AWESOME!! Well done and kudos to you. Submitted by Nightstorm on Sun, 11/18/2012 - 7:09pm. Submitted by Nightstorm on Tue, 11/20/2012 - 9:10pm. Humans with the blood of an outsider flowing through their veins. Be it the blood of an angel, demon or other such being, Nephilim run the gamut no two being alike. All have visible signs of their parentage, be it horns, tails or even wings. Submitted by w00t on Wed, 11/21/2012 - 12:55am. Very cool. I like the darkness effect. Submitted by The Fifth Wanderer on Wed, 11/21/2012 - 1:04am.